$5.38 Frito-Lay Chips Flavor Mix Multipack 20-Pack (1-oz bags) - Full Price...For What?! 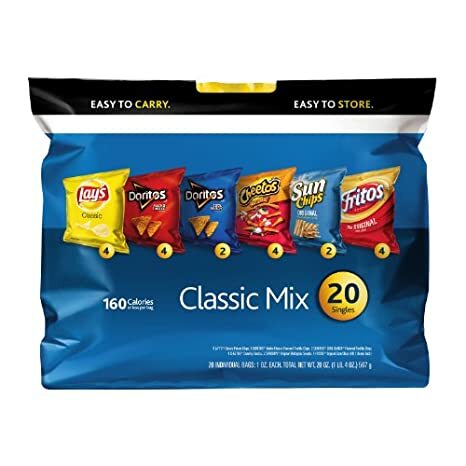 Head on over to Amazon.com and grab these Frito-Lay Chips Flavor Mix Multipack 20-Pack (1-oz bags) for on $5.38 after you clip this $0.50 coupon. They ship FREE with a $35 + purchase and is Amazon Prime eligible and which comes with FREE 2 Day Shipping! This is a great deal and perfect for stocking up on Snack time favorites!!! Sign Up for a FREE 30 Day Trial of Amazon Prime HERE!